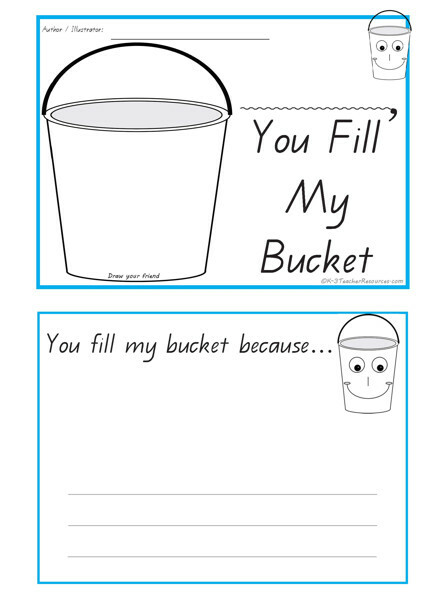 You Fill My Bucket – A little concept book for Bucket Fillers. Thanks to Mandy for this great little suggestion. Great as a whole class A3 size book with each child adding a page about another so there is a page about each child. Title could be 3BP, You Fill My Bucket and picture of whole class in the front bucket image. OR as Mandy suggests – each week all children (perhaps as a literacy station activity) write a book about the ‘Star Student of the Week’ – Child’s name goes on front title eg. Susan, You Fill My Bucket – with a drawing of that child within the bucket image. By the end of the year – each child has a class set of books written just for them – love this idea – thanks Mandy. I love Mandy’s idea of each child writing a book about the ‘Star of the Week’ and what makes them special. Brainstorm, discuss and model writing those positive attributes for children to refer to when writing their little books. The ‘Star of the Week’ takes all the book home to show their family – how special !